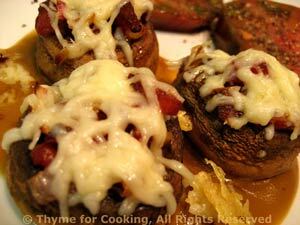 Mushrooms stuffed with Bacon and Tomato, a simple yet elegant starter. I love stuffing vegetables. This is a less-caloric version of a recipe I made years ago, stuffing the mushrooms with lots of bacon and cream cheese - full fat of course. That was good; this is better... And so much less guilt! The Vinaigrette is much thicker and more intense than I would use for a lettuce salad, but works well with the mushrooms and sliced tomato. Cut 3 thick slices out of each tomato. Set aside 4 slices and chop the other 2 slices. Heat oil and soy sauce in nonstick skillet over medium-high heat. Add mushroom caps and sauté until light brown, 3 minutes, turning once. Add shallots, bacon to skillet and sauté until the shallots are tender and the bacon crisp. Remove the bacon and drain on a paper towel. Remove the shallots with a fork or slotted spoon and put in a small bowl. Crumble the bacon and add to the shallots along with the chopped tomato. Stir to combine and spoon mixture into the mushroom caps, dividing evenly. Sprinkle, carefully, with cheese and bake in 400F (200C) oven for 10 - 12 minutes, until they are light brown. To Serve: Place two tomato slices on the side of each plate. Spoon half of the vinaigrette on to the other side and place 3 mushroom caps on top. Slowly add oil, whisking constantly, until thick.